GTFO Announcement Trailer | Nerd Much? "Every detail counts if you are to survive the nightmare." From 10 Chambers Collective, the developers of Payday 2, comes GTFO. This is a four player co-op, which seems to be of the online multiplayer variety. Meaning everyone needs to come the party equipped with a PC in order to play together. It is not explicitly said either way, however, so remember that grain of salt. 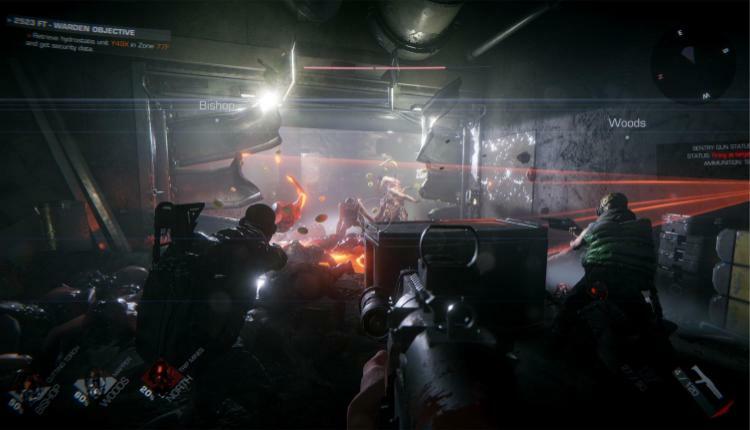 GTFO drops your team in a hostile environment filled to the brim with zombies. While you’re on the run and hoping you don’t disturb a hoard of them, there are plenty of puzzles to solve as you make your way to the next area. Each area is procedurally generated, so you’ll never be in quite the same one each time you play through. Your missions as you go through are not only to GTFO, but also to “explore and extract valuable artefacts from a vast underground complex.” These tasks change per play through, so you’re never quite doing the same thing. This is likely both so you can’t predict the game enough to blaze through and be a terrible team member, and to encourage replayability. With your team, you are required to plan with your team as much as you can and work together to “combine your fire power, communicate, and coordinate as a team.” According to the developers, “every detail counts if you are to survive the nightmare.” We’ll see how in depth that idea will really be when this game comes out. In the trailer above, GTFO certainly looks like a decently made zombie horror game, with a little survival thrown in for fun. It is the co-op aspect that makes it stand out, but that really depends on how the gameplay works out. We’ve had this before Evolved before that game caught fire and died. It had a great idea behind it, just like GTFO, but that doesn’t mean it was executed well or that it was feasible in the long run. GTFO is coming in 2018 on PC.